ShareFile is a secure solution for data exchange from Citrix. PRODOC works in a Citrix environment and has installed the ShareFile Private Cloud Server in its server farm. PRODOC can exchange data with customers and freelances in a secure way via the server. A platform is therefore available for exchanging confidential data and large quantities of data, as can occur in technical translations into several languages. With Citrix ShareFile, you can either work without logging in or as a logged-in user. In both cases, we use the integrated mail system: we can send links for uploads and downloads and be notified by email when the data exchange has taken place. In this case the data exchange takes place via a web application. Data request: PRODOC sends the user a link.The user can upload one or morel files via the link. Data provision: the other way round to the request, the user can download data from the PRODOC server via the link. The user is registered in the Private Cloud and receives his own login data. He can use this login data to access his own directory on the PRODOC Cloud server, either via the web interface or by using the ShareFile desktop app. Data also remains stored in this directory for a long period and the customer has permanent access. A major advantage compared to a data exchange solution via Dropbox or WeTransfer is secure data storage within the PRODOC Private Cloud. Data goes directly from the customer to PRODOC via an encrypted connection, and is therefore subject to the German Data Protection Act. This is a major advantage compared to exchanging via WeTransfer or DropBox. To make data exchange possible, PRODOC creates an account for you on our ShareFile server. Click on the Activate account button or copy the link into your web browser. Check and correct if necessary. You are then in your ShareFile directory and can manage files here. 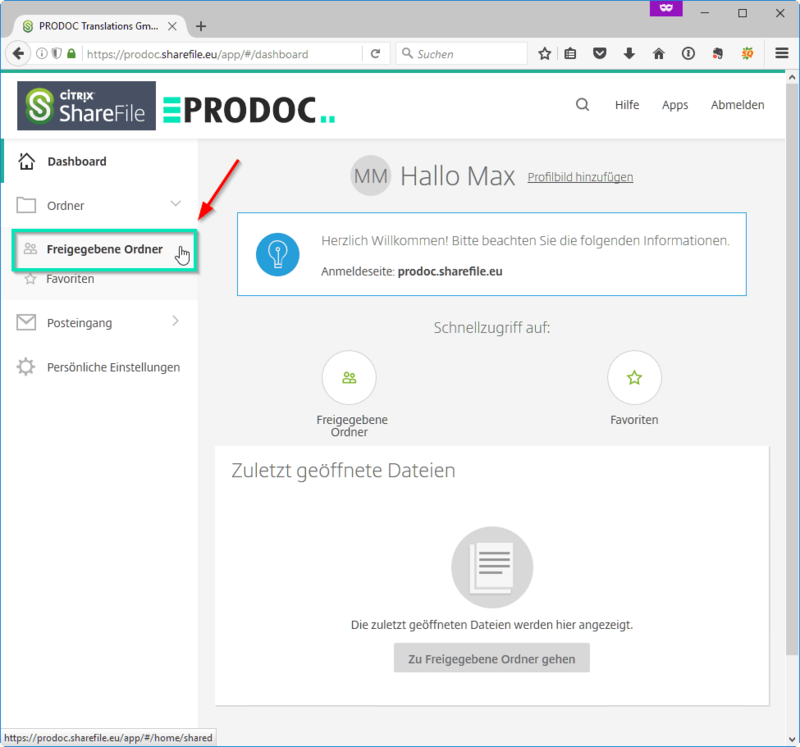 After logging in on the PRODOC.sharefile.eu page with your user name and password, you are taken to the user interface of the PRODOC private cloud. The folders which are used for uploading and downloading files have customer-specific permissions. Your data remains hidden from other users of the PRODOC server. Go into the required folders and activate the checkbox of the files. Click on download to download the selected files. You can optionally specify whether you would like to be informed by email when files are uploaded to this folder. You can also download the ShareFile desktop app by clicking on Apps, which you can install locally. This gives you direct access to ShareFile data without needing to use the browser.